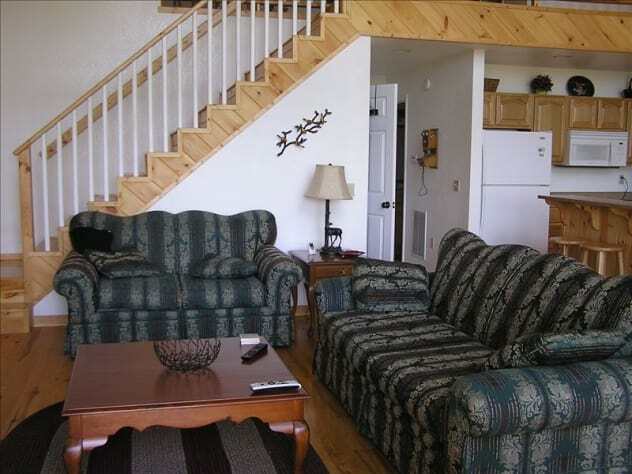 Freebies, Great Views, Sat TV, Wi-Fi, Cell Signal, Popular Cabin! 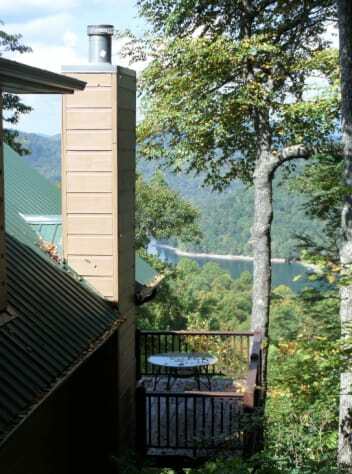 On a ridgetop at 3600 feet elevation, Misty Laurel Chalet has a beautiful view of Lake Nantahala (which is at 3000' elevation) and the Smoky Mountains beyond. Imagine awakening to a gorgeous view of the lake and then taking a brisk walk thru a lovely forest with crisp, clean air. Misty Laurel is spacious - 2400 square feet - with two living areas, both equipped with flat screen TVs, DirecTV HD satellite receivers & DVD players, in addition to three bedrooms, so the kids can entertain themselves downstairs while the adults enjoy themselves upstairs. There's also an extra dining table, full-size refrigerator, microwave, and coffee maker downstairs, so that increases the privacy options. 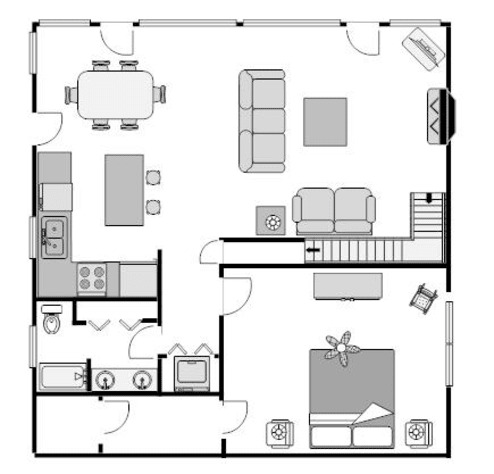 Take a look at the floorplan illustrations below. For ADVENTURE SEEKERS: check out the Area Attractions on our supplemental website at www.mistylaurel.com for information about horseback riding, ziplining, whitewater rafting, biking, fishing and hiking. HOW's THIS FOR A FREEBIE? 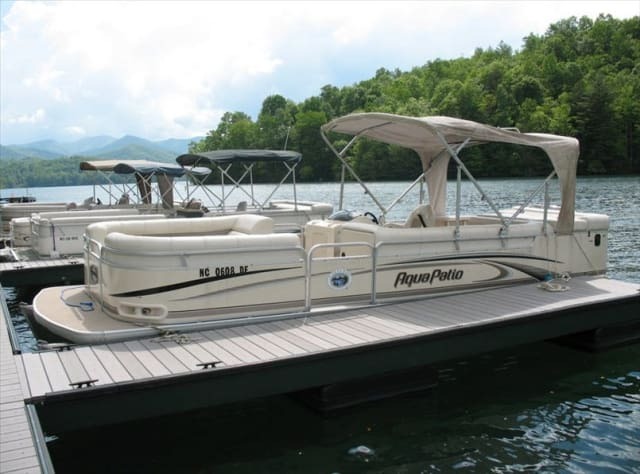 For rentals of at least a week in duration, we are again offering your choice of a FREE half-day pontoon boat rental at Lake's End Marina or a FREE half-day guided fishing trip on Lake Nantahala with Dale Raxter (www.nantahalaguides.com), or a $150 voucher toward a guided fly fishing trip on the Nantahala River with Dakota Rogers (www.nantahalaonthefly.com)! For many of our previous guests, these excursions have been among the most memorable highlights of their visits to Misty Laurel. 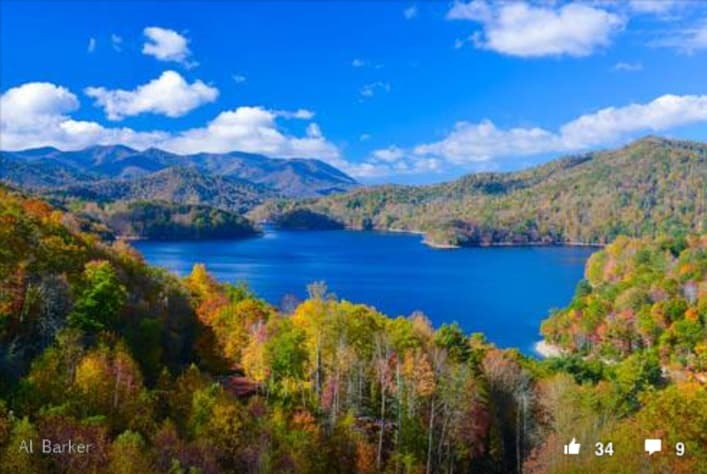 Lake Nantahala is spectacular and there's no better way to see it than from a boat. 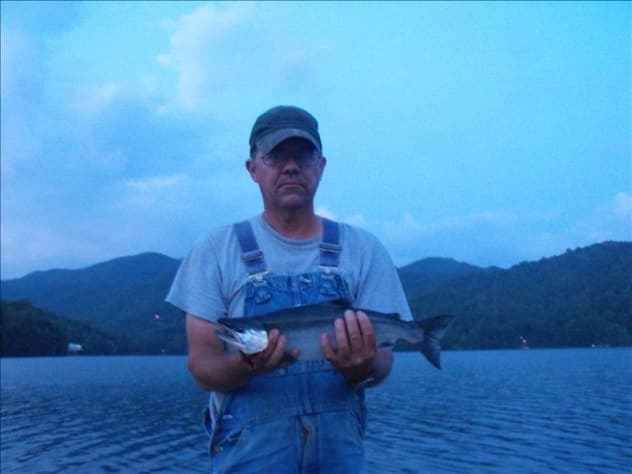 As well as being an excellent guide, Dale is a life-long Nantahala resident and will regale you with his tales as a park ranger and tracker! He was featured in the recent book "Bear in the Back Seat" about the career of a Smoky Mtn. Natl. Park ranger and wildlife expert. 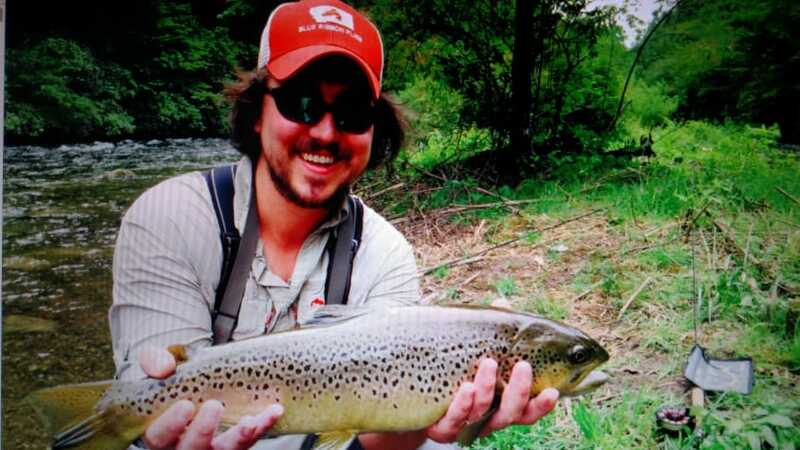 Dakota is the only local fishing guide who can offer a licensed and insured float fishing trip on the famous trout haven, the Nantahala River! MISTY LAUREL / NOC AFFILIATION NOW ENTITLES YOU TO A 10% DISCOUNT AT THE WORLD-FAMOUS NANTAHALA OUTDOOR CENTER! We now have an arrangement with the Nantahala Outdoor Center that entitles Misty Laurel Chalet guests to a 10% discount on the following NOC activities: rafting on any of the 7 rivers served by the NOC, Fontana Lake Kayak Tour, Recreational Kayak Rentals and the rafting portion of the Rapid Transit trip with the Great Smoky Mountain Railroad. This offer is good for ALL our guests, regardless of the length of your stay! 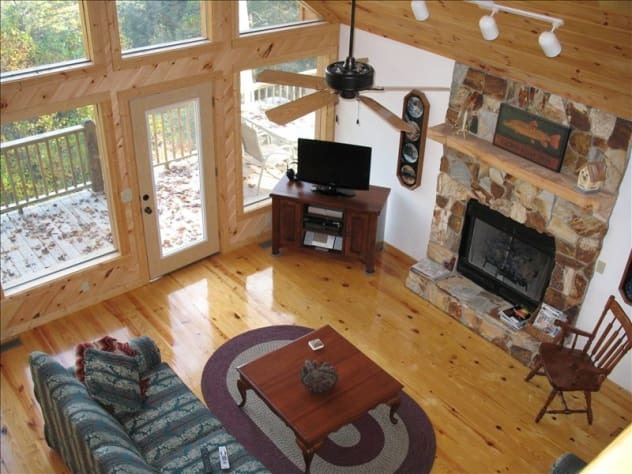 Misty Laurel Chalet is the only cabin at Lake Nantahala offering this NOC discount! Every Sat. nite during June, the NOC has live music (check out the NOC website at www.noc.com). 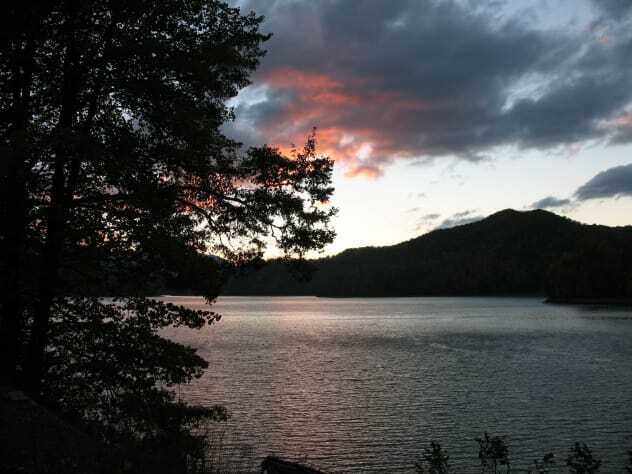 In addition to lake and stream fishing, rafting and kayaking, hiking is an option, as well as gem mining, horseback riding and visiting nearby attractions, such as the Great Smoky Mtn. Natl. Park, Gatlinburg, the incredible Biltmore House (near Asheville), and shopping in Highlands. Downhill skiing and tubing are available throughout the winter at the Cataloochee Ski Area, about an hour's drive to the north at Maggie Valley. 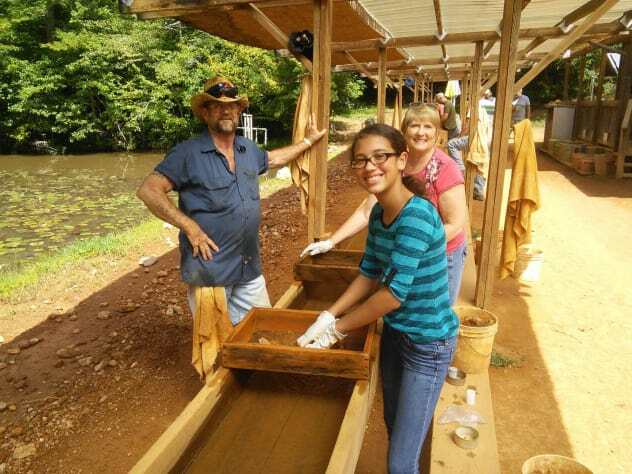 These make great day trips, along with visiting the museums and the casino in Cherokee. There are so many fun things to do, you'll need to come back several times to experience them all! For after-hours entertainment, there are two HD TVs (46-inch & 55 inch), both with HD DirecTV receivers, plus DVD players, and a VCR. Kids (and husbands!) can be exiled to the big-screen TV in the recreation room on the lower level while others enjoy quiet and privacy in the the main floor living area and the loft. We have high-speed DSL service, so you can stream videos from Netflix, etc., and we have Chromecasts on both TVs to facilitate this! FREE use of our 16' canoe (with trailer). FREE UNLIMITED USE 3 Mbps DSL BROADBAND INTERNET is provided by Frontier and can be accessed by Ethernet or Wi-Fi (bring your smart phone, tablet, or laptop). You can easily stream movies, etc., from your favorite provider, such as HuluPlus, Netflix, Amazon, etc. Download the Chromecast app to your smartphone, tablet or laptop and you can easily stream whatever you'd like to watch to the TV! CELL PHONE HOTSPOT! We recently added a Cell Phone Hotspot (for Verizon phones only) so you can now send and receive calls & texts. FREE LONG DISTANCE CALLING THROUGHOUT THE U.S. (no need for a troublesome phone card!). For lots more interior/exterior photos & panoramas, floorplan, rental agreement, maps, area information, recommended restaurants and our contact information, go to the Misty Laurel website at 'Links to More Information' below and for other guests' feedback and photos, etc. This is a great place to relax and enjoy the out-of-doors while still keeping in touch! To check availability and to send an email directly from this site, go to 'Check on Availability' and 'Click to Inquire About This Property' below. We're looking forward to hosting you! I am almost always readily available by cell phone, text, or email and I will do all I can to assist you with whatever your needs are prior to and during your stay. Please consider Misty Laurel for your vacation. I'm sure you'll be pleased, as have many previous guests (see their wonderful testimonials! Pat Greany, Owner. Guests staying for a full 7 night week qualify for a FREE 1/2 day guided fishing trip with Dale Raxter (www.nantahalaguides.com) or pontoon boat rental at Lake's End Marina (www.visitlakesend.com/marina)! My husband and I spent Christmas 2017 at Misty Laurel and had the most wonderful stay. I wanted to write this review since I rely on them when reserving a vacation home. Patrick Greany is every bit of a gracious host, often referring to us as his guests, ensuring we stayed warm due to the cold temperatures. He offered his 24/7 service if we had any issues. Aside from a wonderful host, the home was clean, decorated beautifully with the large windows overlooking the beautiful Lake. The view from inside the home is panoramic. The 3 story home had spacious bedrooms, bathrooms, a media room, beautiful open kitchen with all the amenities one needs, a fabulous fireplace and excellent in home entertainment. Patrick even asked us if we wouldn't mind Christmas decorations so when we walked in the door, we were greeted by a beautiful Christmas tree and other holiday decor. We never wanted to leave other than to take a drive into town to pick up provisions. 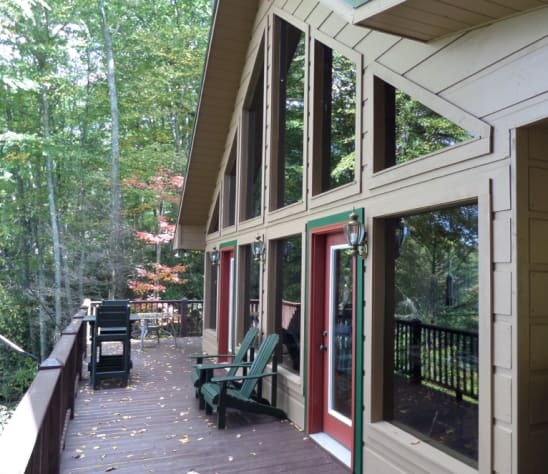 There's plenty to do if you like the outdoors, but we enjoyed overlooking the Lake and soaking in the complete silence that this secluded retreat offers. Coming from Ft. Lauderdale, silence is a commodity. Complete quiet was soothing to the soul, while listening to the rustling of the leaves from a slight wind or the hooves of passing deer. We loved it so much that we wanted to share this and highly recommend this for anyone looking for a beautiful and quiet retreat. This is a definite 5 star accommodation. Myself and some family/friends spent the weekend before Thanksgiving at the Misty Laurel Chalet. The views are stunning and the house is beautiful. This is a place that is fully stocked with just about everything you could think of but the food itself! There's a gas grill, full kitchen with appliances and coffee maker, linens, board games, etc. We did not want for anything. They also provide a canoe and firepit with already split wood waiting for s'mores, and we got to see a bit of first snow for the season! The grocery wasn't far away for picking up supplies on the way in and the lake is right in view. Patrick was super communicative. He provides directions and maps, and the house has a handbook for just about anything you could think of - we had a storm the last night and the power was knocked out, but with landlines, the handbook, and Pat's help, we were covered on emergency lighting, extra blankets, and the number for the power company with little disruption to our plans of sitting in front of the fireplace and relaxing. He called to make sure we made it alright and is available at any time to assist if you should need it! For those of you who may have to work or connect from the cabin - the internet was capable of having to vpn and work remotely while having others streaming Netflix. I'd highly recommend this cabin - waking up in the loft, sitting up and looking out the floor-to-ceiling windows of the mountain and lakeside view at sunrise was worth the trip alone! 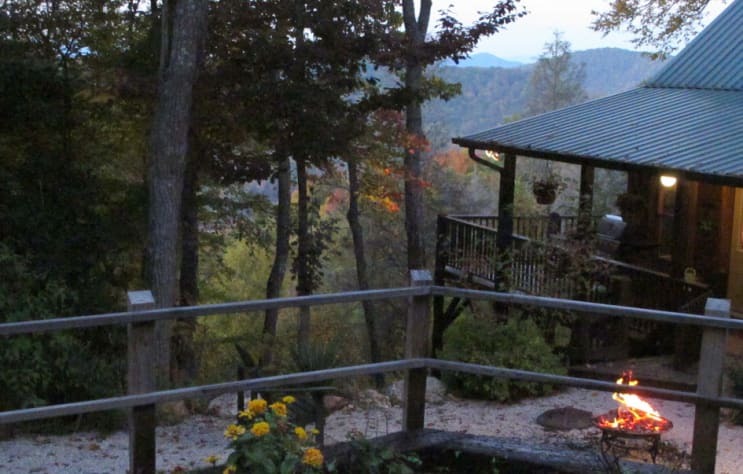 Misty Laurel is a perfect getaway space into the mountains. It's a spaceous cabin that is well stocked. The views in the images speak for themselves. Pat is also a good reference for local hikes and attractions. Great hosting you! I really am glad to be able to provide a jumping-off place for folks who're interested in the natural beauty of the area! This place is amazing! The view is wonderful and is the perfect place for a relaxing weekend. There's absolutely nothing missing: full kitchen, cozy beds and towels, bathroom supplies etc, everything was took care to the detail. Thanks Pat and Jo! Pat is an amazing host, always easy to contact and willing to help beyond the expected. We'll definitely going to come back for more incredible getaway weekends! Thanks, Magda! It was a pleasure hosting you and we'll be looking forward to your next visit! We can't thank Patrick enough for everything, from his generosity and resourcefulness at a very stressing time (hurricane Irma evacuees) he has made it all much easier. The location is breathtaking, with plenty of activities to be done near by. 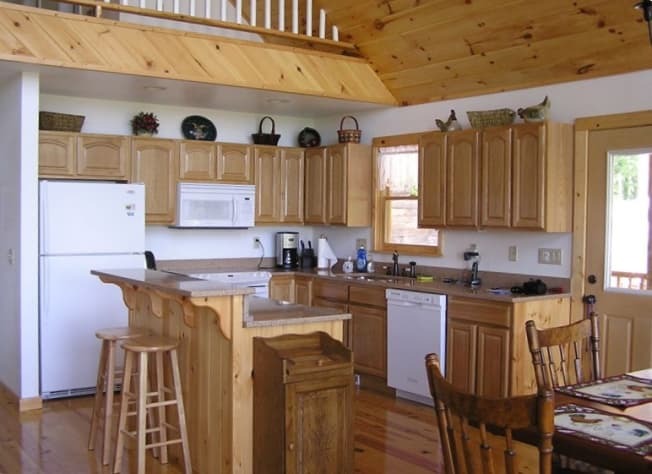 The cabin is a dream, it is well equipped with just about anything you may need and very spacious for everyone. Patrick was great at communicating and giving advice on what to do, and making sure our stay went well. He truly went above and beyond specially with the circumstances. I would recommend this place to anyone! Thanks again Patrick ! Great place to view solar eclipse! This home was awesome!! Our family visited for the solar eclipse and both the eclipse and the home exceeded our expectations. 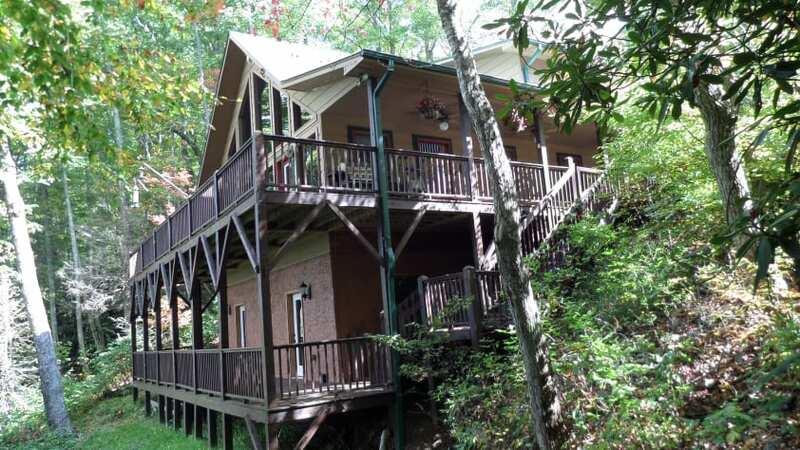 The house is located near the top of a mountain overlooking Nantahala lake. The view of the lake from the deck is framed by the trees surrounding the property. It is so peaceful. If you are looking for a place to get away, this is it. My wife is a stickler for cleanliness and she was thrilled. 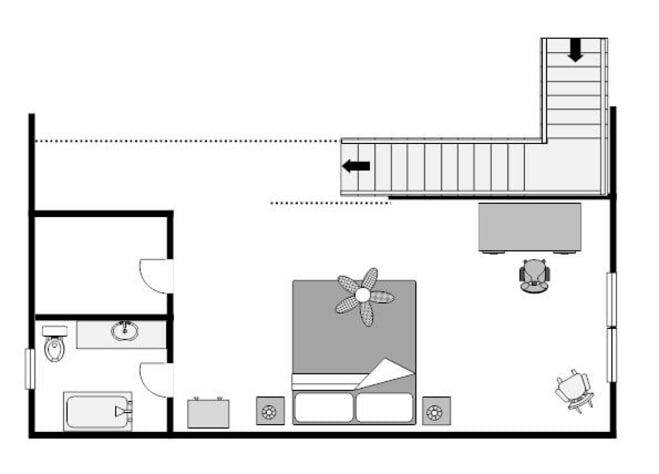 The home has a huge deck that is mostly shielded from the sun by the house, so it never really gets too hot. 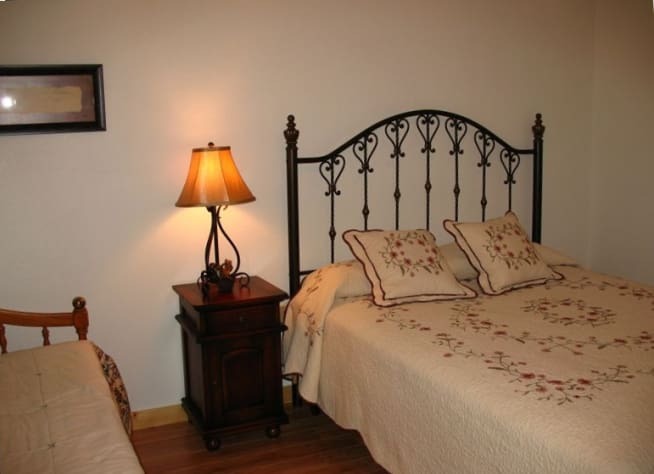 The rooms are very large and the beds were extremely comfortable. The lower level is pretty secluded from the upper levels so it gives a lot of privacy if you were to bring two families to the home. The area surrounding the home is great too. Our family took in the lake and the whitewater rafting with Carolina Outfitters on the Nantahala river. The people in the town were very genuine and gracious hosts. This was one of the best "relaxing" family trips we've ever had. We WILL be back. Thank you Patrick! Great place! Worked well for our group. Patrick was helpful and communicative. Misty Laurel is our favorite cabin of all times! My husband and I have thoroughly enjoyed Misty Laurel on two previous visits, especially the gorgeous view and peace of the beautiful cabin. On this trip, we were joined by our four young adult sons. 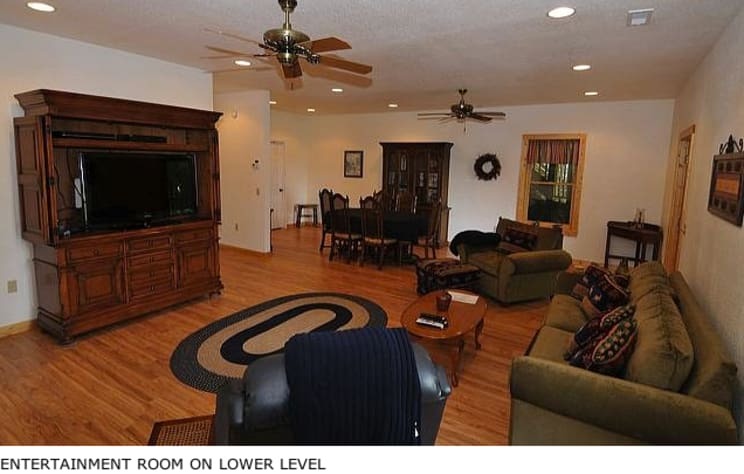 The downstairs became their "man cave" which worked well for my husband and I who had the loft. We enjoyed days of hiking and whitewater rafting, our favorites being the Nantahala River rafting, the Rufus Morgan waterfall trail, and the Siler Bald hike on the AT (360 degree view of mountain ranges!) We even saw a bear while driving down from Wayah Bald. Pat is the ultimate host, and makes us feel like friends. He is eager to ensure our stay is pleasant and worry-free. With the beauty of the cabin, the view, and the surrounding mountains, our vacation gave us the respite and peace we needed. Thanks so much, Pat! 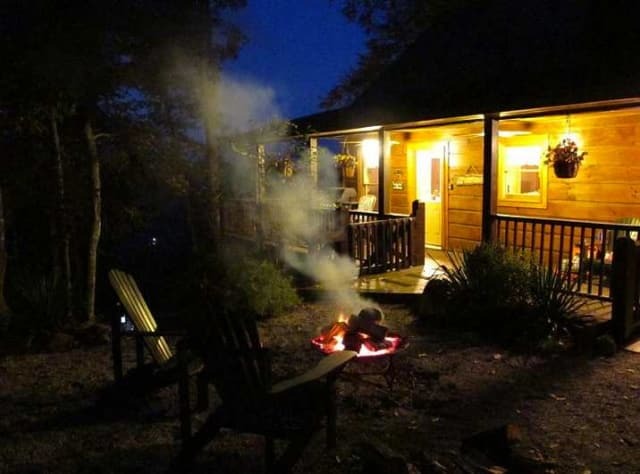 Great Place with an awesome view and the cabin is very well maintained. Patrick's is a great guy with great communication and fulfilling the host needs. 26th Wedding Anniversary at Misty Laurel! Today is our last day at Misty Laurel. Lynn and I have been here, for seven magnificent days, celebrating our 26th wedding anniversary. It's off season, so we have pretty much had the lake and all of it's surrounding mountain splendor to ourselves. 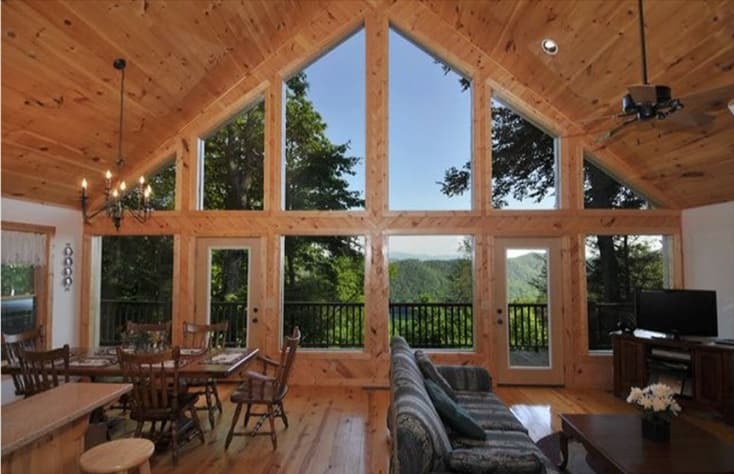 Misty Laurel Chalet itself is one of THE most beautiful cabins we have ever seen. It is almost too heavenly to leave. A few of our days here, we were content just to set in the cabin and enjoy the views. The cabin is way too large for the two of us. But, has everything we could ever need. Words can not describe the views. One of our favorite thing at the cabin has been to wake up and look out over the lake from our loft bedroom. If peace and tranquility isn't your cup of tea, don't come here during off season. We know, in a month or so, the lake will fill up with vacationers that will undoubtedly have a wonderful experience. However, Lynn and I have enjoyed the peace of being by ourselves. You can sit out on the deck any time of the day and not hear any traffic, any sirens, any anything but the birds chirping and a breeze blowing through the trees. At night, you are able to see EVERY star in the sky. If you do get bored, there are many roads and trails to drive or walk down. Each one of them an adventure of it's own. Bring your 4-Wheel drive! The roads are hilly and winding. But oh so beautiful. Although off season has advantages, I wouldn't recommend it during snow and ice. We have thoroughly enjoyed every minute of every day we have spent at Misty Laurel. "The best cabin we have stayed in by a mile!" Misty Laurel Chalet is an absolute gem and was the perfect place to spend our 15 day Christmas holiday vacation. Not only did Misty Laurel exceed all our expectations but the owner, Pat, exceeded them too in every possible way. I honestly could not imagine a more helpful or accommodating person, which is a huge comfort when planning a big vacation like this. He ensured our every need, question, desire was met...sometimes before we had even thought of them! It was great that we also got to meet him at Thanksgiving while we were in his hometown for a family gathering. A genuinely great guy! The location of Misty Laurel Chalet was perfect for us. Secluded but not completely remote. There are some other houses in the area but none were intrusive and the other owners we spoke to were very inviting. One even brought us a bottle of wine to enjoy over Christmas! The view was perfect overlooking the mountains and lake below through the massive windows running the length (and height) of the living and dining area. My parents, who enjoyed the loft sleeping area, loved waking up to that view each morning. Andrews was the closest town for groceries and was a 15 to 20 minute journey along some good roads. Franklin was slightly further and along the very bendy Wayah Rd. which take a little longer but has more to offer. 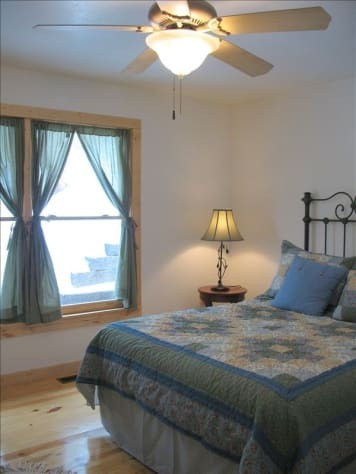 We had three couples staying at Misty Laurel for a short time and not once did we feel like we were tripping over one another or in each others space. There was loads of room and the three fully equipped bathrooms helped a lot. The cabin had all the utensils and appliances we needed to comfortably cook at home with ease and there were plenty of starter items like dishwasher tablets, laundry soap, and hand wash. Just bring food and you will be good to go for a few days until you explore. We enjoyed several wonderful walks in the area as well as some further afield. If you enjoy geocaching there are many to choose from. The Appalachian Trail passes nearby. The Bartrum trail is even closer. For those with reduced mobility take a drive up to Wayah Bald Tower and you will be treated to magnificent mountain-top views with very little effort. I could go on but honestly you just need to book this place up and go try it yourself. 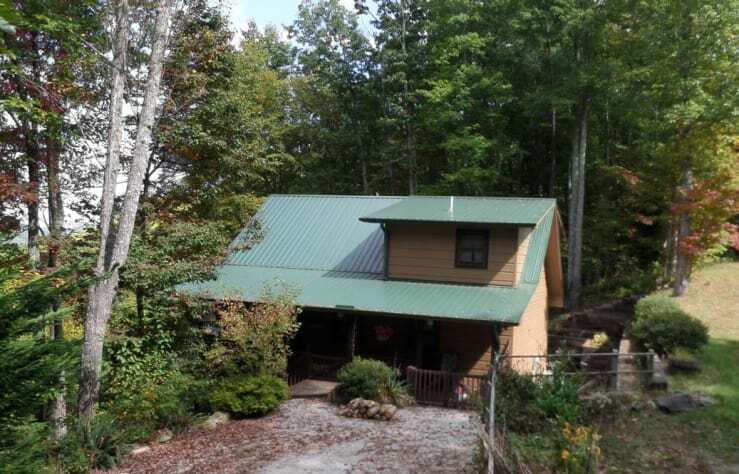 If you like a place right in or very close to town it may not be for you, but if you want a great location, a great cabin, peace and quiet with wonderful views, and an awesome owner to look out for you the Misty Laurel is for you. Dear Richard, I really appreciate the incredible review! * What a pleasure to know that we met or exceeded all your expectations! We know that other prospective guests pay close attention to these reviews so it's very helpful to have such a wonderful review from you! I genuinely hope you will be back again during the summer or fall as there are a lot of attractions available then that aren't open at Christmas. BTW, we're pleased to offer our repeat guests a discount! All the best! Pat * To anyone reading this - this was an unsolicited, honest review - not something I wrote myself! We absolutely loved our stay at Misty Laurel this past weekend. We arrived late at night and Pat kindly check on us to see if we had arrived safely and if we needed anything. The cabin was beautifully decorated for the holidays and was surprisingly very well stocked. The views were just incredible. Lots of hiking and activities to do around the area. Pat was very accommodating by allowing us to check out late. I would highly recommend staying here and we look forward to coming back to stay at the Misty Laurel! Thanks Pat! Misty Laurel provides the perfect setting for a weekend getaway! The views from the villa and surrounding area are beyond gorgeous. 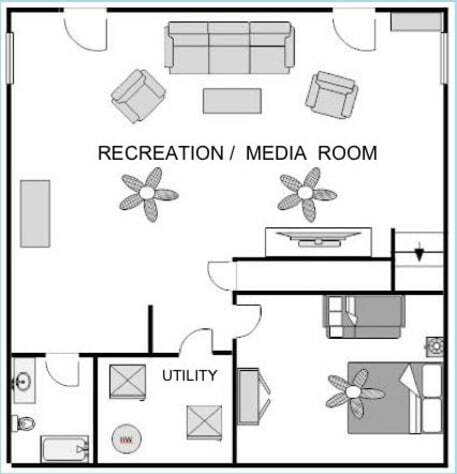 The space includes all the amenities that one could ask for or need! Whether you are looking for a private family gathering or a weekend escape with friends, I highly recommend this villa for its absolutely stunning views, private location, and easy access to surrounding recreational activities. Nantahala!! 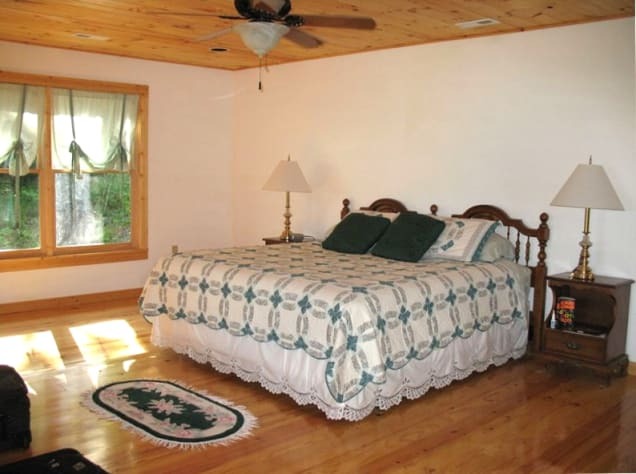 The cabin is decorated in a warm and inviting fashion. Everything is perfectly clean and orderly. The kitchen had everything you need. Just a lovely place to stay. The views off the deck are amazing. 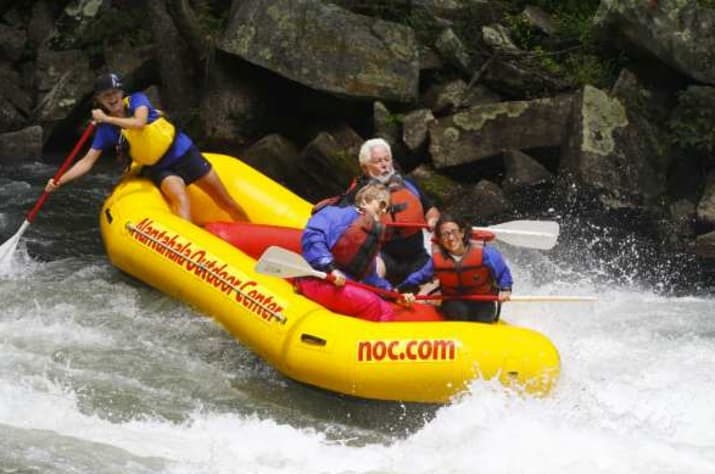 We went white water rafting on the Nantahala River and gem mining and we visited the Smoky Mountains several times. We walked up Clingman's Dome and visited the Little Greenbrier School. On the way home we visited the Biltmore Estate in Asheville, North Carolina. We visited Cherokee, North Carolina and the Museum of the Cherokee Indians. There were many, many other things to do that we didn't get to. We had an absolutely wonderful time and the cabin and its owners, Pat and Jo, were tremendously helpful and kind! Highly recommend this cabin for anyone with a family or anyone wanting a peaceful, tranquil and cozy place to stay.